In North America people variously describe the electricity available from their household receptacles as 110 and 120 volts, using the terms interchangeably. For all intents and purposes, the terms mean the same because transmission losses and power drops can reduce the 120-volt power supplied by the power company to as little as 110 volts by the time it reaches a receptacle. The true voltage at most receptacles is usually somewhere between these values. There is no international standard for the voltage of electricity supplied to residences and commercial establishments. In many countries, including those in Europe, 240 volts is the standard, while in Japan the standard is 100 volts. In North America, power comes into a home's service panel (breaker box) through two cables, each at a voltage of 120 volts. Lighting and standard appliances require the power from only one of these cables, but when it is necessary to run an appliance that requires a higher voltage, the cables can be combined with special wiring and fixtures to provide 240-volt power. The rated voltage input in each cable the power company feeds to a service panel is 120 volts plus or minus five percent due to fluctuations in transmission loss in the power lines. This means that the power at the panel can be as low as 114 volts. As the electricity encounters resistance in conductors and does work while passing through electrical devices along its path, its voltage drops still lower. In a house with extensive circuitry, it is not unusual to get a 110 volt reading or less at receptacles far from the panel. 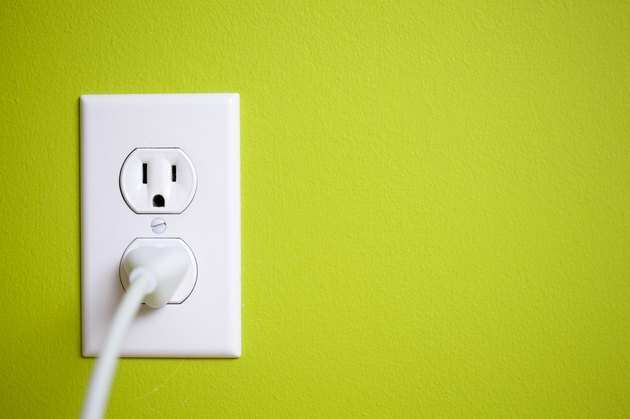 Most appliances are rated for 120 volts, so if your receptacle is supplying electricity at a smaller voltage, the worst that can happen is that it won't work as well. Chances are better, however, that you won't notice any difference in its performance. If a nameplate on an appliance shows that it has a 110 plug, this most likely means that the appliance is designed to operate at 120 volts, but will continue to operate normally if the voltage drops to 110 volts. You may begin to notice a loss in performance in some appliances if you plug them into a long extension cord. The receptacles and plugs used in countries with 240-volt standard voltage are shaped differently than those in North America so you can't confuse them; receptacles and plugs in Japan, where the standard is 100 volts, are shaped the same. 100 vs 120 volts is different enough to affect the operation of a Japanese appliance plugged into a North American circuit. In particular, electric toilet seats, or washlets, made in Japan have been known to overheat and catch fire. On the other hand, the voltage in Japanese circuits isn't large enough to operate North American appliances at their full power. Can a Sudden Power Outage Damage Electrical Appliances? How Far Apart Should Outlets Be in a Room?